CARS, trucks, motorbikes; all the things you might expect to see lined up at a busy Mackay intersection during peak hour. But not a mobility scooter. Luke Harrison, of Glenella, had to look twice when he saw this guy sitting front and centre of a line of traffic, at the intersection of the Bruce Hwy and Heaths and Sams Rds. "I couldn't believe him sitting there in front of the truck," Mr Harrison said. Mr Harrison's grandfather used to ride a similar scooter. "But he rolled it over when he was 89 years old," he said. "He tried to mount a curb, but he was alright, he was a tough old bugger." 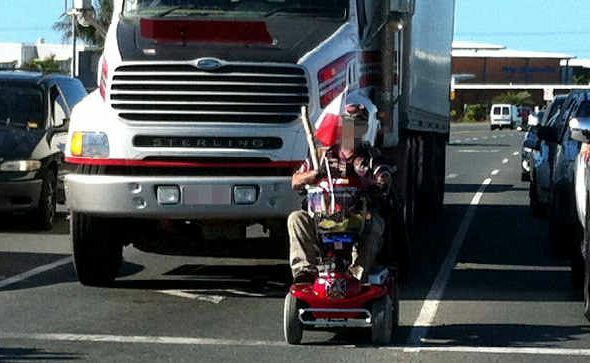 Senior Constable Jason Robertson, of the Mackay traffic branch, said mobility scooters were not permitted to be driven as a motor vehicle. "That one (pictured) has possibly committed several different offences," he said. He said the law stated scooters must use the footpath or nature strip where available, but not be driven as a car. For further information on the legal use of mobility scooters visit www.tmr.qld.gov.au. Are mobility scooters a hazard? This poll ended on 26 June 2012.